Mark, Holly, Ben, Khaki, and I walked in the Alzheimer's Memory Walk this past Saturday morning at a park in Allen near Ben's and my house. It was a wonderful morning for a quick 3 mile walk. The weather was absolutely perfect! My dad's mom, Nana, has severe Alzheimer's and is now living in a nursing home in Houston near Dad and his family. Therefore, this weekend's walk was in honor of my grandmother, Mary Havens. Strange. 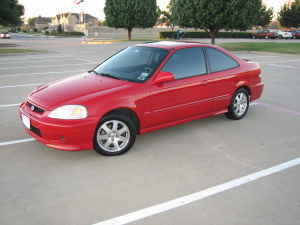 I have hated Ben's 2000 Civic SI so much, yet I am very sad to see it being sold today. I cannot explain how or why I have become so attached to Ben's little red car, but I have. However, I am very excited for Ben because he is getting a new car on Sunday which he is greatly anticipating. His Gramma is selling her '98 Mustang GT to him for a fraction of its value with only 12,000 miles on the odometer. This will be such a blessing as Ben's Civic has right at 100,000 miles and was begining to require frequent trips to the shop for minor repairs. I am so happy for Ben, yet, I am a little teary-eyed at saying good-bye to Raider. It has been a really good car, even if I did hate it. This past week I had a convention for work in Salt Lake City, Utah. Though I did much more work than sight seeing while I was away, I must give a couple of compliments to Ole Utah. The weather was absolutely wonderful while I was there. The high each day was in the upper 60's or low 70's. It was really what fall should feel like! I definitely miss the cool weather now that I am back in Dallas and the high today should be about 87 degrees. Also, I didn't realize what a wonderful view of the mountains can be seen from downtown SLC. They were really beautiful. For dinner one night, I ate at the Sky Bar and Grill which had panoramic views of the city and the mountains. It was a spectacular sight. Other than great dinners each night, the only other truly fun thing I did was to hang out in the hot tub, pool, and sauna. It was so relaxing!!! Despite the currently hot, muggy weather of Dallas, I am SO glad to be home. I am quite content simply visiting SLC.